Furber, Elizabeth Chapin (1969). 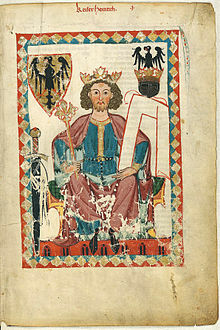 "The Kingdom of Cyprus, 1191–1291". In Setton, Kenneth M.; Wolff, Robert Lee; Hazard, Harry. A History of the Crusades, Volume II: The Later Crusades, 1189–1311. The University of Wisconsin Press. pp. 599–629. ISBN 0-299-04844-6. Hardwicke, Mary Nickerson (1969). 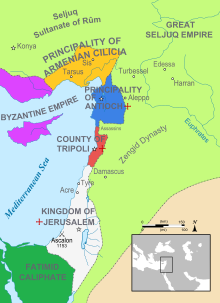 "The Crusader States, 1192–1243". In Setton, Kenneth M.; Wolff, Robert Lee; Hazard, Harry. A History of the Crusades, Volume II: The Later Crusades, 1189–1311. The University of Wisconsin Press. pp. 522–554. ISBN 0-299-04844-6. Johnson, Edgar N. (1969). "The Crusades of Frederick Barbarossan and Henry VI". In Setton, Kenneth M.; Wolff, Robert Lee; Hazard, Harry. A History of the Crusades, Volume II: The Later Crusades, 1189–1311. The University of Wisconsin Press. pp. 87–122. ISBN 0-299-04844-6. Painter, Sidney (1969). "The Third Crusade: Richard the Lionhearted and Philip Augustus". In Setton, Kenneth M.; Wolff, Robert Lee; Hazard, Harry. A History of the Crusades, Volume II: The Later Crusades, 1189–1311. The University of Wisconsin Press. pp. 45–85. ISBN 0-299-04844-6. Gerish, Deborah (2006). "Aimery of Lusignan". In Murray, Alan V. The Crusades: An Encyclopedia. 1. ABC-CLIO. p. 24. ISBN 978-1-576-07862-4.